If you seek help with a crash or a severe slowdown with Classic Shell, it would be most helpful if you capture a dump from Explorer. If your taskbar disappears and restarts and all Explorer folder windows close themselves after Classic Shell is installed, it means your Explorer.exe process is crashing for some reason. By capturing a crash dump, the issue can be identified. 2) Unzip it in some folder that doesn't need admin permissions (not in Windows or Program Files). Unzipping it to the Desktop folder, for example or the Documents folder will do just fine. If you don't know how to unzip compressed zip files, here's how you can do that: you can right click them -> Open with -> Windows Explorer. Then click the Extract all command. 3) Open a command prompt in that folder. To do this, open the folder where you unzipped Procdump, then press Shift and while you are holding down Shift, right click in an empty/white area of the folder. 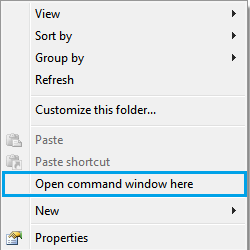 In the context menu, you will see the option "Open command window here". Click it. OR, another way to open the command prompt is to simply open the folder where you extracted procdump.exe in File Explorer. Then press Alt+D to focus on the address bar, press Backspace to erase the existing address bar text, and type: 'cmd' (without quotes) in the Address bar and press Enter. This method will open command prompt at the folder where you have procdump.exe. Note: After giving one of the above commands, you might get this error message "Multiple processes match the specified name." In that case,open Control Panel -> Folder Options / File Explorer Options and switch to the View tab. Scroll down and make sure that the option "Launch folder windows in a separate process" is unchecked. If it is checked, then turn it off, click OK, close File Explorer and log off your user account and login again, to close any extraneous Explorer.exe instances. If you cannot capture a crash dump, then try a slowdown dump, and vice versa. What you perceived as a crash might be a slowdown which is eventually causing Windows to restart an unresponsive Explorer.exe. Then run the appropriate procdump command mentioned in step 4 again (it should no longer give you the above mentioned error with only one Explorer.exe process running). 5) After you capture a few dumps, compress them into ZIP. This will make the size of the dumps significantly smaller and easier to upload. To put any *.dmp files inside a ZIP file, select all the dumps (.dmp files) and right click on any of the selected files -> Send To -> Compressed (zipped) folder. This will create a ZIP file in the same folder as the .dmp files. Now attach the ZIP to your bug report in this forum (the forum has Upload/Attach files feature when you click "Full Editor"). If the file is too big to attach here, try to upload it somewhere like OneDrive, Google Drive or Dropbox, and post the link here. Important: Please enter a description for the file - who is it from and what is it for. Or post a message in the forums so it is clear what the dump is for. After you do this, any time some program crashes, a dump will be saved in that folder. Next time Explorer crashes go to that folder and look for the newest file named "explorer.exe.something.dmp". The advantage over using procdump is that you need to set this up only once and don't have to remember to run procdump every time. It is also useful if explorer crashes very early after login before you can run procdump. Here are ready-to-use registry files you can use if you are not comfortable or familiar with Registry editing. Just download this ZIP file and extract and run the Set up Explorer dump creation.reg file inside it to merge it into the Registry. After that, every time Explorer.exe crashes, 9 dumps will be created on your Desktop. You can compress them inside a ZIP file, then delete them from your computer and upload them in an appropriate post in the forum for further analysis. To stop the creation of dumps whenever Explorer crashes, run the other file Stop Explorer dump creation.reg.